Powers/Abilities: Vaun Lysander wore a suit of protective armor, and was armed with energy rifles. 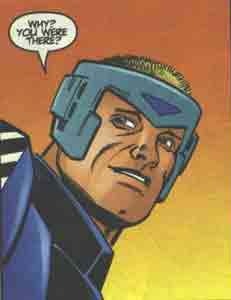 History: (Seeker 3000#1)- Vaun was a friend of Cyrene and Carter Shaw aboard Seeker 3000, and pulled strings so that he could accompany his friends on a survey mission at the Calver Fermion Theta Cluster. However, their mule soon encountered Jakarah, god-ship of the Hkkkt, and they were shot down in an asteroid field. (Seeker 3000#2)- Vaun and the others were saved from death by the Medusae, a nomadic tribe of aliens victimized by the Hkkkt. Lhasa of the Hkkkt agreed to aid them in battling the Hkkkt. (Seeker 3000#3)- Vaun, Carter, Cyrene and the Hkkkt aided in the battle against the Hkkkt aboard Seeker 3000, but he and Carter needed to be saved from one of the Hkkkt by Cyrene. 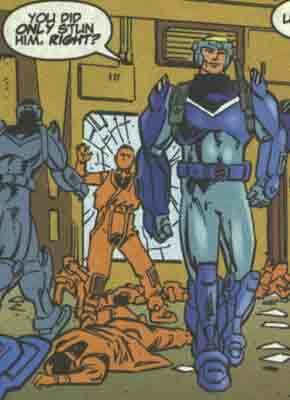 (Seeker 3000#4)- They soon met up with the rest of the crew, who had taken to hide within the Pathfinders' "Dead Zones." Vaun aided in their final battle with the Hkkkt, which ended when the Pathfinders unleashed a psychic assault which slew nearly all of the Hkkkt. Comments: Created by Dan Abnett, Ian Edginton, Andrew Currie and Art Nichols.